Joseph Vissarionovich Dzhugashvili ( Georgian: იოსებ ჯუღაშვილი; Russian: Ио́сиф Виссарио́нович Джугашвили, Iosif Vissarionovich Dzhugashvili; December 18, 1878 [ O.S. December 6] – March 5, 1953), better known by his adopted name, Joseph Stalin (alternatively transliterated Josef Stalin), was the de facto leader of the Soviet Union from about 1928 until his death in 1953. Stalin held the title of General Secretary of the Central Committee of the Communist Party of the Soviet Union (1922-1953) — a position originally without significant influence but which, through Stalin's ascendancy, became that of de facto party leader. Between 1934 and 1953, this office was nominally but one of several Central Committee Secretaryships, but his leadership was universally acknowledged. Born Iosif Vissarionovich Dzhugashvili ( Georgian: იოსებ ჯუღაშვილი; Russian: Иосиф Виссарионович Джугашвили [Iosif Vissarionovič Džugašvili]), Stalin became General Secretary of the Soviet Communist Party in 1922. Following the death of Vladimir Lenin, during the 1920s he prevailed in a power struggle over Leon Trotsky. In the 1930s Stalin initiated the Great Purge, a campaign of political repression, persecution and killings that reached its peak in 1937. Stalin's rule had long-lasting effects on the features that characterized the Soviet state from the era of his rule to its collapse in 1991—though Maoists, anti-revisionists and some others say he was actually the last legitimate Socialist leader in the Soviet Union's history. Stalin claimed his policies were based on Marxism-Leninism; they are now often considered to represent a political and economic system called Stalinism. Stalin replaced the New Economic Policy (NEP) of the 1920s with Five-Year Plans in 1928 and collective farming at roughly the same time. The Soviet Union was transformed from a predominantly peasant society to a major world industrial power by the end of the 1930s. Confiscations of grain and other food by the Soviet authorities under his orders contributed to a famine between 1932 and 1934, especially in the key agricultural regions of the Soviet Union, Ukraine (see Holodomor), Kazakhstan and North Caucasus that resulted in millions of deaths. Many peasants resisted collectivization and grain confiscations, but were repressed, most notably well-off peasants deemed " kulaks." Bearing the brunt of the Nazis' attacks (around 75% of the Wehrmacht's forces), the Soviet Union under Stalin made the largest and decisive contribution to the defeat of Nazi Germany during World War II (known in the USSR as the Great Patriotic War, 1941–45). After the war, Stalin established the USSR as one of the two major superpowers in the world, a position it maintained for nearly four decades following his death in 1953. Stalin's rule - reinforced by a cult of personality - fought real and alleged opponents mainly through the security apparatus, such as the NKVD. Nikita Khrushchev, Stalin's henchman and eventual successor, denounced Stalin's rule and the cult of personality in 1956, initiating the process of " de-Stalinization" which later became part of the Sino-Soviet Split. Reliable sources about Stalin's youth are few; however those which were left were subject to censorship as was common during Stalin's reign. Some consider the writings of Stalin's daughter, Svetlana Alliluyeva to be the most reliable sources, since they were not censored. Rarely seeing his family and drinking heavily, Vissarion often beat his wife and small son. One of Stalin's friends from childhood wrote, "Those undeserved and fearful beatings made the boy as hard and heartless as his father." The same friend also wrote that he never saw him cry. A young Stalin, circa 1894. Another of his childhood friends, Iremashvili, felt that the beatings by Stalin's father gave him a hatred of authority. He also said that anyone with power over others reminded Stalin of his father's cruelty. Stalin had broken his arm several times over his life. There have been reports of Stalin having one arm shorter than the other. One of the people for whom Ekaterina did laundry and house-cleaning was a Gori Jew, David Papismedov. Papismedov gave Joseph, who would help out his mother, money and books to read, and encouraged him. Decades later, Papismedov came to the Kremlin to learn what had become of little "Soso". Stalin surprised his colleagues by not only receiving the elderly man, but happily chatting with him in public places. In 1888, Stalin's father left to live in Tiflis, leaving the family without support. Rumors said he died in a drunken bar fight; however, others said they had seen him in Georgia as late as 1931. At the age of eight, "Soso" began his education at the Gori Church School. When attending school in Gori, "Soso" was among a very diverse group of students. Joseph and most of his classmates were Georgian and spoke mostly Georgian. However, at school they were forced to use Russian. Even when speaking in Russian, their Russian teachers mocked Joseph and his classmates because of their Georgian accents. His peers were mostly the sons of affluent priests, officials, and merchants. During his childhood, Joseph was fascinated by stories he read telling of Georgian mountaineers who valiantly fought for Georgian independence. His favorite hero in these stories was a legendary mountain ranger named Koba, which became Stalin's first alias as a revolutionary. He graduated first in his class and at the age of 14 he was awarded a scholarship to the Seminary of Tiflis ( Tbilisi, Georgia), a Jesuit institution (one of his classmates was Krikor Bedros Aghajanian, the future Grégoire-Pierre Cardinal Agagianian, see ) which he attended from 1894 and onward. Although his mother wanted him to be a priest (even after he had become leader of the Soviet Union), he attended seminary not because of any religious vocation, but because of the lack of locally available university education. In addition to the small stipend from the scholarship Stalin was paid for singing in the choir. Stalin's involvement with the socialist movement (or, to be more exact, the branch of it that later became the communist movement) began at the seminary. During these school years, Stalin joined a Georgian Social-Democratic organization, and began propagating Marxism. Stalin quit the seminary in 1899 just before his final examinations; official biographies preferred to state that he was expelled. He then worked for a decade with the political underground in the Caucasus, experiencing repeated arrests and exile to Siberia between 1902 and 1917. Stalin adhered to Vladimir Lenin's doctrine of a strong centralist party of professional revolutionaries. Stalin and Lenin attended the Fifth Congress of the Russian Social Democratic Labour Party in London in 1907 (see ). This congress consolidated the supremacy of Lenin's Bolshevik Party and debated strategy for communist revolution in Russia. Stalin never referred to his stay in London. In the period after the Revolution of 1905 Stalin led "fighting squads" in bank robberies to raise funds for the Bolshevik Party. His practical experience made him useful to the party, and gained him a place on its Central Committee in January 1912. Joseph Stalin, Vladimir Lenin, and Mikhail Kalinin meeting in 1919. 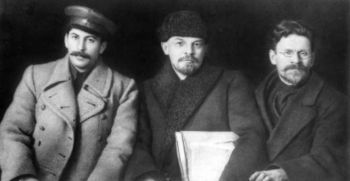 All three of them were " Old Bolsheviks"; members of the Bolshevik party before the Russian Revolution of 1917. His only significant contribution to the development of the Marxist theory at this time was a treatise, written while he was briefly in exile in Vienna, Marxism and the National Question. It presents an orthodox Marxist position (c.f. Lenin's On the Right of Nations to Self-Determination). This treatise may have contributed to his appointment as People's Commissar for Nationalities Affairs after the revolution . In 1901, the Georgian clergyman M. Kelendzheridze wrote an educational book on language arts, including one of Stalin’s poems, signed by 'Soselo'. In 1907 the same editor published “A Georgian Chrestomathy, or collection of the best examples of Georgian literature” including a poem of Stalin’s dedicated to Rafael Eristavi. His poetry can still be seen in the Stalin Museum in Gori. Stalin's first wife, Ekaterina Svanidze, died in 1907, only four years after their marriage. At her funeral, Stalin allegedly said that any warm feelings he had for people died with her, for only she could melt his 'stony heart'. To him, her life was the only thing that made him happy. They had a son together, Yakov Dzhugashvili, with whom Stalin did not get along in later years. 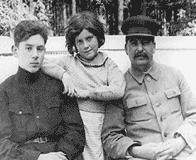 Stalin with his children: Vassili and Svetlana. His son finally shot himself because of Stalin's harshness toward him, but survived. After this, Stalin said "He can't even shoot straight". Yakov served in the Red Army during World War II and was captured by the Germans. They offered to exchange him for Fieldmarshal Paulus, but Stalin turned the offer down, allegedly saying "A lieutenant is not worth a general"; others credit him with saying "I have no son," to this offer, and Yakov is said to have committed suicide, running into an electric fence in Sachsenhausen concentration camp, where he was being held. His second wife was Nadezhda Alliluyeva, who died in 1932; she may have committed suicide by shooting herself after a quarrel with Stalin, leaving a suicide note which according to their daughter was "partly personal, partly political". Officially, she died of an illness. With her, he had two children: a son, Vassili, and a daughter, Svetlana. Vassili rose through the ranks of the Soviet air force, officially dying of alcoholism in 1962; however, this is still in question. He distinguished himself in World War II as a capable airman. Svetlana emigrated to the United States in 1967. 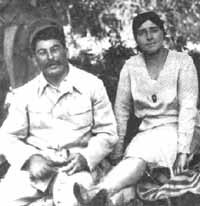 In his book The Wolf of the Kremlin, Stuart Kahan claimed that Stalin was secretly married to a third wife named Rosa Kaganovich. Rosa was the sister of Lazar Kaganovich, a Soviet politician. However, the claim is unproven and many have disputed this claim, including the Kaganovich family, who deny that Rosa and Stalin ever met. Stalin's mother died in 1937; he did not attend the funeral but instead sent a wreath. In March 2001, Russian Independent Television NTV discovered a previously unknown grandson living in Novokuznetsk. Yuri Davydov told NTV that his father had told him of his lineage, but, because the campaign against Stalin's cult of personality was in full swing at the time, he was told to keep quiet. The Soviet dissident writer, Alexander Solzhenitsyn, had mentioned a son being born to Stalin and his common-law wife, Lida, in 1918 during Stalin's exile in northern Siberia. In 1912 Stalin was co-opted to the Bolshevik Central Committee at the Prague Party Conference. In 1917 Stalin was editor of Pravda, the official Communist newspaper, while Lenin and much of the Bolshevik leadership were in exile. Following the February Revolution, Stalin and the editorial board took a position in favour of supporting Kerensky's provisional government and, it is alleged, went to the extent of declining to publish Lenin's articles arguing for the provisional government to be overthrown. In April 1917, Stalin was elected to the Central Committee with the third highest vote total in the party and was subsequently elected to the Politburo of the Central Committee (May 1917); he held this position for the remainder of his life. According to many accounts, Stalin only played a minor role in the revolution of November 7. Other writers, such as Adam Ulam, have argued that each man in the Central Committee had a specific job to which he was assigned. All practical work in connection with the organisation of the uprising was done under the immediate direction of Comrade Trotsky, the President of the Petrograd Soviet. It can be stated with certainty that the Party is indebted primarily and principally to Comrade Trotsky for the rapid going over of the garrison to the side of the Soviet and the efficient manner in which the work of the Military Revolutionary Committee was organised. Note: Although this passage was quoted in Stalin's book The October Revolution issued in 1934, it was expunged in Stalin's Works released in 1949. Later, in 1924, Stalin himself created a myth around a so-called "Party Centre" which "directed" all practical work pertaining to the uprising, consisting of himself, Sverdlov, Dzerzhinsky, Uritsky, and Bubnov. However, no evidence was ever shown for the activity of this "centre", which would, in any case, have been subordinate to the Military Revolutionary Council, headed by Trotsky. During the Russian Civil War and Polish-Soviet War, Stalin was a political commissar in the Red Army at various fronts. Stalin's first government position was as People's Commissar of Nationalities Affairs (1917–1923). He was also People's Commissar of the Workers and Peasants Inspection (1919–1922), a member of the Revolutionary Military Council of the republic (1920–23) and a member of the Central Executive Committee of the Congress of Soviets (from 1917). 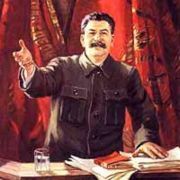 On April 3, 1922, Stalin was made general secretary of the Central Committee of the All-Russian Communist Party (Bolsheviks), a post that he subsequently built up into the most powerful in the country. It has been claimed that he initially attempted to decline accepting the post, but was refused. This position was seen to be a minor one within the party (Stalin was sometimes referred to as "Comrade Card-Index" by fellow party members) but, when coupled with leadership over the Orgburo, actually had potential as a power base as it allowed Stalin to fill the party with his allies. Due to Stalin's popularity within the Bolshevik party he gained plenty of political power. This took the dying Lenin by surprise, and in his last writings he famously called for the removal of the "rude" Stalin. However, this document was voted on as to its adoption by the Party in a Congress - and a unanimous vote to reject the document was taken by all members of the Congress as Lenin was at this time deemed very ill.
After Lenin's death in January 1924, Stalin, Kamenev, and Zinoviev together governed the party, placing themselves ideologically between Trotsky (on the left wing of the party) and Bukharin (on the right). During this period, Stalin abandoned the traditional Bolshevik emphasis on international revolution in favour of a policy of building " Socialism in One Country", in contrast to Trotsky's theory of Permanent Revolution. In the struggle for leadership one thing was evident; whoever ended up ruling the party had to be considered very loyal to Lenin. Stalin organized Lenin's funeral and made a speech professing undying loyalty to Lenin, in almost religious terms. He undermined Trotsky, who was sick at the time, possibly by misleading him about the date of the funeral. Thus although Trotsky was Lenin’s associate throughout the early days of the Soviet regime, he lost ground to Stalin. Stalin made great play of the fact that Trotsky had joined the Bolsheviks just before the revolution, and publicized Trotsky's pre-revolutionary disagreements with Lenin. Another event that helped Stalin's rise was the fact that Trotsky came out against publication of Lenin's Testament in which he pointed out the strengths and weaknesses of Stalin and Trotsky and the other main players, and suggested that he be succeeded by a small group of people. An important feature of Stalin’s rise to power is the way that he manipulated his opponents and played them off against each other. Stalin formed a " troika" of himself, Zinoviev, and Kamenev against Trotsky. When Trotsky had been eliminated Stalin then joined Bukharin and Rykov against Zinoviev and Kamenev, emphasising their vote against the insurrection in 1917. Zinoviev and Kamenev then turned to Lenin's widow, Krupskaya; they formed the " United Opposition" in July 1926. In 1927 during the 15th Party Congress Trotsky and Zinoviev were expelled from the party and Kamenev lost his seat on the Central Committee. Stalin soon turned against the " Right Opposition", represented by his erstwhile allies, Bukharin and Rykov. Stalin gained popular appeal from his presentation as a 'man of the people' from the poorer classes. The Russian people were tired from the world war and the civil war, and Stalin's policy of concentrating in building "Socialism in One Country" was seen as an optimistic antidote to war. Stalin took great advantage of the ban on factionalism which meant that no group could openly go against the policies of the leader of the party because that meant creation of an opposition. By 1928 (the first year of the Five-Year Plans) Stalin was supreme among the leadership, and the following year Trotsky was exiled because of his opposition. Having also outmaneuvered Bukharin's Right Opposition and now advocating collectivization and industrialization, Stalin can be said to have exercised control over the party and the country. However, as the popularity of other leaders such as Sergei Kirov and the so-called Ryutin Affair were to demonstrate, Stalin did not achieve absolute power until the Great Purge of 1936–38. No reference to Joseph Stalin can be made without reference to his unmatched ability at mastering the use of intelligence and the secret police. He turned the Soviet political police, the Cheka (later, the GPU and OGPU), into an arm of state-sanctioned murder. Stalin also vastly increased the foreign espionage activities of Soviet secret police and foreign intelligence. Under his guiding hand, Soviet intelligence forces began to set up intelligence networks in most of the major nations of the world, including Germany (the famous Rote Kappelle spy ring), Great Britain, France, Japan, and the United States. Stalin saw no difference between espionage, communist political propaganda actions, and state-sanctioned violence, and he began to integrate all of these activities within the NKVD. Stalin made considerable use of the Communist International movement in order to infiltrate agents and to ensure that foreign Communist parties remained pro-Soviet and pro-Stalin. One of the best early examples of Stalin's ability to integrate secret police and foreign espionage came in 1940, when he gave approval to the secret police to have Leon Trotsky assassinated in Mexico. The Russian Civil War and wartime communism had a devastating effect on the country's economy. Industrial output in 1922 was 13% of that in 1914. A recovery followed under the New Economic Policy, which allowed a degree of market flexibility within the context of socialism. Under Stalin's direction, this was replaced by a system of centrally ordained "Five-Year Plans" in the late 1920s. These called for a highly ambitious program of state-guided crash industrialization and the collectivization of agriculture. With no seed capital, little international trade, and virtually no modern infrastructure, Stalin's government financed industrialization by both restraining consumption on the part of ordinary Soviet citizens, to ensure that capital went for re-investment into industry, and by ruthless extraction of wealth from the kulaks. In 1933, worker's real earnings sank to about one-tenth of the 1926 level. There was also use of the unpaid labor of both common and political prisoners in labor camps and the frequent "mobilization" of communists and Komsomol members for various construction projects. The Soviet Union also made use of foreign experts, e.g. British engineer Stephen Adams, to instruct their workers and improve their manufacturing processes. In spite of early breakdowns and failures, the first two Five-Year Plans achieved rapid industrialization from a very low economic base. While there is general agreement among historians that the Soviet Union achieved significant levels of economic growth under Stalin, the precise rate of this growth is disputed. Official Soviet estimates placed it at 13.9%, Russian and Western estimates gave lower figures of 5.8% and even 2.9%. Indeed, one estimate is that Soviet growth temporarily was much higher after Stalin's death. Stalin's regime moved to force collectivization of agriculture. This was intended to increase agricultural output from large-scale mechanized farms, to bring the peasantry under more direct political control, and to make tax collection more efficient. Collectivization meant drastic social changes, on a scale not seen since the abolition of serfdom in 1861, and alienation from control of the land and its produce. Collectivization also meant a drastic drop in living standards for many peasants, and it faced violent reaction among the peasantry. In the first years of collectivization, it was estimated that industrial and agricultural production would rise by 200% and 50%, respectively; however, agricultural production actually dropped. Stalin blamed this unanticipated failure on kulaks (rich peasants), who resisted collectivization. (However, kulaks only made up 4% of the peasant population; the "kulaks" that Stalin targeted included the moderate middle peasants who took the brunt of violence from the OGPU and the Komsomol. The middle peasants were about 60% of the population). Therefore those defined as "kulaks," "kulak helpers," and later "ex-kulaks" were to be shot, placed into Gulag labor camps, or deported to remote areas of the country, depending on the charge. The two-stage progress of collectivization — interrupted for a year by Stalin's famous editorial, " Dizzy with success" ( Pravda, March 2, 1930), and " Reply to Collective Farm Comrades" (Pravda, April 3, 1930) — is a prime example of his capacity for tactical political withdrawal followed by intensification of initial strategies. Many historians assert that the disruption caused by collectivization was largely responsible for major famines. (Chairman Mao Zedong of China would trigger a similar famine in 1959 to 1961 with his Great Leap Forward). During the 1932–1933 famine in Ukraine and the Kuban region, now often known in Ukraine as the Holodomor (Ukrainian: Голодомор), not only "kulaks" were killed or imprisoned. The controversial Black Book of Communism and other sources document that all grains were taken from areas that did not meet targets, including the next year's seed grain. It also claims that peasants were forced to remain in the starving areas, sales of train tickets were stopped, and the State Political Directorate set up barriers to prevent people from leaving the starving areas. Soviet authorities and other historians have argued that tough measures and the rapid collectivization of agriculture were necessary in order to achieve an equally rapid industrialization of the Soviet Union and ultimately win World War II. This is disputed by other historians such as Alec Nove, who claim that the Soviet Union industrialized in spite of, rather than thanks to, its collectivized agriculture. Science in the Soviet Union was under strict ideological control, along with art and literature. There was significant progress in "ideologically safe" domains, owing to the free Soviet education system and state-financed research. However, in several cases the consequences of ideological pressure were dramatic — the most notable examples being the " bourgeois pseudosciences" genetics and cybernetics. In the late 1940s there were also attempts to suppress special and general relativity, as well as quantum mechanics, on grounds of " idealism. "; But the chief Soviet physicists made it clear that without using these theories, they would be unable to create a nuclear bomb. Linguistics was the only area of Soviet academic thought to which Stalin personally and directly contributed. At the beginning of Stalin's rule, the dominant figure in Soviet linguistics was Nikolai Yakovlevich Marr, who argued that language is a class construction and that language structure is determined by the economic structure of society. Stalin, who had previously written about language policy as People's Commissar for Nationalities, felt he grasped enough of the underlying issues to coherently oppose this simplistic Marxist formalism, ending Marr's ideological dominance over Soviet linguistics. Stalin's principal work discussing linguistics is a small essay, "Marxism and Linguistic Questions." Although no great theoretical contributions or insights came from it, neither were there any apparent errors in Stalin's understanding of linguistics; his influence arguably relieved Soviet linguistics from the sort of ideologically driven theory that dominated genetics. Scientific research was hindered by the fact that many scientists were sent to labor camps (including Lev Landau, later a Nobel Prize winner, who spent a year in prison in 1938–1939) or executed (e.g. Lev Shubnikov, shot in 1937). They were persecuted for their dissident views, not for their research. Nevertheless, much progress was made under Stalin in some areas of science and technology. It laid the ground for the famous achievements of Soviet science in the 1950s, such as the development of the BESM-1 computer in 1953 and the launching of Sputnik in 1957. Indeed, many politicians in the United States expressed a fear, after the " Sputnik crisis," that their country had been eclipsed by the Soviet Union in science and in public education. The Soviet people also benefited from a degree of social liberalization. Females were given an adequate, equal education and women had equal rights in employment, precipitating improving lives for women and families. Stalinist development also contributed to advances in health care, which vastly increased the lifespan for the typical Soviet citizen and the quality of life. Stalin's policies granted the Soviet people universal access to health care and education, effectively creating the first generation free from the fear of typhus, cholera, and malaria. The occurrences of these diseases dropped to record-low numbers, increasing life spans by decades. Soviet women under Stalin were also the first generation of women able to give birth in the safety of a hospital, with access to prenatal care. Education was also an example of an increase in standard of living after economic development. The generation born during Stalin's rule was the first near-universally literate generation. Engineers were sent abroad to learn industrial technology, and hundreds of foreign engineers were brought to Russia on contract. Transport links were also improved, as many new railways were built. Workers who exceeded their quotas, Stakhanovites, received many incentives for their work. They could thus afford to buy the goods that were mass-produced by the rapidly expanding Soviet economy. With the industrialization and heavy human losses due to World War II and repressions the generation that survived under Stalin saw a major expansion in job opportunities, especially for women. Stalin propaganda poster, reading: "Beloved Stalin—good fortune of the people!" During Stalin's reign the official and long-lived style of Socialist Realism was established for painting, sculpture, music, drama and literature. Previously fashionable "revolutionary" expressionism, abstract art, and avant-garde experimentation were discouraged or denounced as " formalism". Careers were made and broken, some more than once. Famous figures were not only repressed, but often persecuted, tortured and executed, both "revolutionaries" (among them Isaac Babel, Vsevolod Meyerhold) and "non-conformists" (for example, Osip Mandelstam). A minority, both representing the "Soviet man" ( Arkady Gaidar) and remnants of the older pre-revolutionary Russia ( Konstantin Stanislavski), thrived. A number of émigrés returned to the Soviet Union, among them Alexei Tolstoi in 1925, Alexander Kuprin in 1936, and Alexander Vertinsky in 1943. Poet Anna Akhmatova was subjected to several cycles of suppression and rehabilitation, but was never herself arrested. Her first husband, poet Nikolai Gumilev, had been shot in 1921, and her son, historian Lev Gumilev, spent two decades in a gulag. The degree of Stalin's personal involvement in general and specific developments has been assessed variously. His name, however, was constantly invoked during his reign in discussions of culture as in just about everything else; and in several famous cases, his opinion was final. Stalin's occasional beneficence showed itself in strange ways. For example, Mikhail Bulgakov was driven to poverty and despair; yet, after a personal appeal to Stalin, he was allowed to continue working. His play, The Days of the Turbines, with its sympathetic treatment of an anti-Bolshevik family caught up in the Civil War, was finally staged, apparently also on Stalin's intervention, and began a decades-long uninterrupted run at the Moscow Arts Theatre. Some insights into Stalin's political and esthetic thinking might perhaps be gleaned by reading his favorite novel, Pharaoh, by the Polish writer Bolesław Prus, a historical novel on mechanisms of political power. Similarities have been pointed out between this novel and Sergei Eisenstein's film, Ivan the Terrible, produced under Stalin's tutelage. In architecture, a Stalinist Empire Style (basically, updated neoclassicism on a very large scale, exemplified by the seven skyscrapers of Moscow) replaced the constructivism of the 1920s. Stalin's rule had a largely disruptive effect on the numerous indigenous cultures that made up the Soviet Union. The politics of the Korenization and forced development of "Cultures National by Form, Socialist by their substance" was arguably beneficial to later generations of indigenous cultures in allowing them to integrate more easily into Russian society. The attempted unification of cultures in Stalin's later period was very harmful. Political repressions and purges had even more devastating repercussions on the indigenous cultures than on urban ones, since the cultural elite of the indigenous culture was often not very numerous. The traditional lives of many peoples in the Siberian, Central Asian and Caucasian provinces was upset and large populations were displaced and scattered in order to prevent nationalist uprisings. An amusing anecdote has it that the Moskva Hotel in Moscow was built with mismatched side wings because Stalin had mistakenly signed off on both of the two proposals submitted, and the architects had been too afraid to clarify the matter. In actuality the hotel had been built by two independent teams of architects that had differing visions of how the hotel should look. Stalin's role in the fortunes of the Russian Orthodox Church is complex. Continuous persecution in the 1930s resulted in its near-extinction: by 1939, active parishes numbered in the low hundreds (down from 54,000 in 1917), many churches had been levelled, and tens of thousands of priests, monks and nuns were persecuted. During World War II, however, the Church was allowed a revival as a patriotic organization, after the NKVD had recruited the new metropolitan, the first after the revolution, as a secret agent. Thousands of parishes were reactivated, until a further round of suppression in Khrushchev's time. The Russian Orthodox Church Synod's recognition of the Soviet government and of Stalin personally led to a schism with the Russian Orthodox Church Outside Russia that remains not fully healed to the present day. Just days before Stalin's death, certain religious sects were outlawed and persecuted. Many religions popular in the ethnic regions of the Soviet Union including the Roman Catholic Church, Uniats, Baptists, Islam, Buddhism, Judaism, etc. underwent ordeals similar to the Orthodox churches in other parts: thousands of monks were persecuted, and hundreds of churches, synagogues, mosques, temples, sacred monuments, monasteries and other religious buildings were razed. Left: Beria's January 1940 letter to Stalin, asking permission to execute 346 " enemies of the CPSU and of the Soviet authorities" who conducted "counter-revolutionary, right-Trotskyite plotting and spying activities." Middle: Stalin's handwriting: "за" (support). Right: The Politburo's decision is signed by Secretary Stalin. Stalin, as head of the Politburo, consolidated near-absolute power in the 1930s with a Great Purge of the party, justified as an attempt to expel 'opportunists' and 'counter-revolutionary infiltrators'. Those targeted by the purge were often expelled from the party, however more severe measures ranged from banishment to the Gulag labor camps, to execution after trials held by NKVD troikas. The Purges commenced after the assassination of Sergei Kirov, the popular leader of the party in Leningrad. Kirov was very close to Stalin and his assassination sent chills through the Bolshevik party. 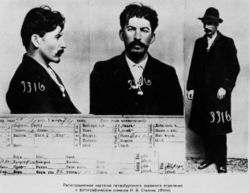 Stalin, fearing that he might be next, began tightening security, (and in effect to remove those who might have threatened Stalin's leadership) by seeking out alleged spies and counter-revolutionaries. Several trials known as the Moscow Trials were held, but the procedures were replicated throughout the country. There were four key trials during this period: the Trial of the Sixteen (August 1936); Trial of the Seventeen (January 1937); the trial of Red Army generals, including Marshal Tukhachevsky (June 1937); and finally the Trial of the Twenty One (including Bukharin) in March 1938. Most notably in the case of alleged Nazi collaborator Tukhachevsky, many military leaders were convicted of treason. The shakeup in command may have cost the Soviet Union dearly during the German invasion of 22 June 1941, and its aftermath. The repression of so many formerly high-ranking revolutionaries and party members led Leon Trotsky to claim that a "river of blood" separated Stalin's regime from that of Lenin. Solzhenitsyn alleges that Stalin drew inspiration from Lenin's regime with the presence of labor camps and the executions of political opponents that occurred during the Russian Civil War. Trotsky's August 1940 assassination in Mexico, where he had lived in exile since January 1937, eliminated the last of Stalin's opponents among the former Party leadership. Only three members of the " Old Bolsheviks" (Lenin's Politburo) now remained — Stalin himself, "the all-Union Chieftain" (всесоюзный староста) Mikhail Kalinin, and Chairman of Sovnarkom Vyacheslav Molotov. Nikolai Yezhov, the young man strolling with Stalin to his left, was shot in 1940. He was edited out from a photo by Soviet censors . Such retouching was a common occurrence during Stalin's reign. No segment of society was left untouched during the purges. Article 58 of the legal code, listing prohibited "anti-Soviet activities", was applied in the broadest manner. Initially, the execution lists for the enemies of the people were confirmed by the Politburo. Over time the procedure was greatly simplified and delegated down the line of command. People would inform on others arbitrarily, to attempt to redeem themselves, or to gain small retributions. The flimsiest pretexts were often enough to brand someone an " Enemy of the People," starting the cycle of public persecution and abuse, often proceeding to interrogation, torture and deportation, if not death. Nadezhda Mandelstam, the widow of the poet Osip Mandelstam and one of the key memoirists of the Purges, recalls being shouted at by Akhmatova: "Don't you understand? They are arresting people for nothing now?" The Russian word troika gained a new meaning: a quick, simplified trial by a committee of three subordinated to NKVD. Towards the end of the purge, the Politburo relieved NKVD head Nikolai Yezhov, from his position for overzealousness. He was subsequently executed. Some historians such as Amy Knight and Robert Conquest postulate that Stalin had Yezhov and his predecessor, Genrikh Yagoda, removed in order to deflect blame from himself. In parallel with the purges, efforts were made to rewrite the history in Soviet textbooks and other propaganda materials. Notable people executed by NKVD were removed from the texts and photographs as though they never existed. Gradually, the history of revolution was transformed to a story about just two key characters: Lenin and Stalin. Shortly before, during and immediately after World War II, Stalin conducted a series of deportations on a huge scale which profoundly affected the ethnic map of the Soviet Union. It is estimated that between 1941 and 1949 nearly 3.3 million were deported to Siberia and the Central Asian republics. Separatism, resistance to Soviet rule and collaboration with the invading Germans were cited as the official reasons for the deportations. Declassified Soviet documents appear to state that the property of the deported Crimean Tatars and other minorities from Crimea during the World War II should be shipped to the new place and each deported family should be given a loan of about 5000 roubles for 7 years without charge for interest to start up in the new place . J. Otto Pohl found that deportees were actually forced to leave their belongings behind, their property was confiscated and they have never received any compensation for it and that the loans did not exist. Along with the deportation of Crimea Tatars, the Soviet government issued an order to deport Crimean Greeks, Armenians and Bulgarians . 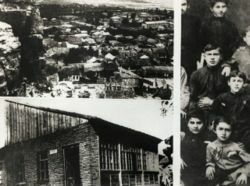 Crimean Greeks were rounded up by the NKVD and put on overcrowded unhygienic trains for deportation; they lost their homes, their livestock, and most of their moveable property. Deportees were exiled to special settlements, where conditions weren't significantly different from the Gulag. During Stalin's rule the following ethnic groups were deported completely or partially: Ukrainians, Poles, Koreans, Volga Germans, Crimean Tatars, Kalmyks, Chechens, Ingush, Balkars, Karachays, Meskhetian Turks, Finns, Bulgarians, Greeks, Armenians, Latvians, Lithuanians, Estonians, and Jews. Large numbers of Kulaks, regardless of their nationality, were resettled to Siberia and Central Asia. Deportations took place in appalling conditions, often by cattle truck, and hundreds of thousands of deportees died en route . Those who survived were forced to work without pay in the labour camps. Many of the deportees died of hunger or other conditions. In February 1956, Nikita Khrushchev condemned the deportations as a violation of Leninist principles, and reversed most of them, although it was not until as late as 1991 that the Tatars, Meskhs and Volga Germans were allowed to return en masse to their homelands. The deportations had a profound effect on the peoples of the Soviet Union. The memory of the deportations played a major part in the separatist movements in the Baltic States, Tatarstan and Chechnya, even today. Early researchers of the number killed by Stalin's regime were forced to rely largely upon anecdotal evidence, and their estimates range as high as 60 million. But with the collapse of the Soviet Union in 1991, hard evidence from the Soviet archives finally became available, and such estimates became more difficult to sustain. For example, the archives record that about 800,000 prisoners were executed (for either political or criminal offences) under Stalin, while another 1.7 million died of privation or other causes in the Gulags and some 389,000 perished during kulak resettlement - a total of about 3 million victims. Debate continues however , since some historians believe the archival figures to be unreliable. Also, it is generally agreed that the data are incomplete, since some categories of victim were carelessly recorded by the Soviets - such as the victims of ethnic deportations, or of German population transfer in the aftermath of WWII. Thus, while some archival researchers have posited the number of victims of Stalin's repressions to be no more than about 4 million in total , others believe the number to be considerably higher. Russian writer Vadim Erlikman, for example, has made the following estimations: Executions 1.5 million, Gulag 5 million, Deportations 1.7 million (out of 7.5 million deported), and POW's and German civilians 1 million, for a total of about 9 million victims of repression. Some have also included the 6 to 8 million victims of the 1932-33 famine . But again historians differ, this time as to whether or not the famine victims were purposive killings - as part of the campaign of repression against kulaks - or whether they were simply unintended victims of the struggle over forced collectivization. Regardless, it appears that a minimum of around 10 million surplus deaths (4 million by repression and 6 million from famine) are attributable to the regime, with a number of recent books suggesting a probable figure of somewhere between 15 to 20 million. Adding 6-8 million famine victims to Erlikman's estimates above, for example, would yield a figure of between 15 and 17 million victims. Pioneering researcher Robert Conquest, meanwhile, has revised his original estimate of up to 30 million victims down to 20 million. Others, however, continue to maintain that their earlier much higher estimates are correct. After the failure of Soviet and Franco-British talks on a mutual defense pact in Moscow, Stalin began to negotiate a non-aggression pact with Hitler's Germany. In his speech on August 19, 1939, Stalin prepared his comrades for the great turn in Soviet policy, the Molotov-Ribbentrop Pact with Nazi Germany. According to a controversial Russian author living in the UK, Viktor Suvorov, Stalin expressed in the speech an expectation that the war would be the best opportunity to weaken both the Western nations and Nazi Germany, and make Germany suitable for "Sovietization". Whether this speech was ever delivered to the public and what its content was is still debated. (see Stalin's speech on August 19, 1939). 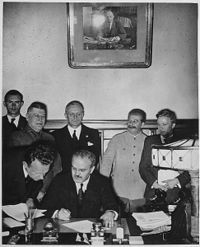 Stalin (in background to the right) looks on as Molotov signs the Molotov-Ribbentrop Pact. Officially a non-aggression treaty only, the Molotov-Ribbentrop Pact had a "secret" annex according to which Central Europe was divided into the two powers' respective spheres of influence. The USSR was promised an eastern part of Poland, primarily populated with Ukrainians and Belorussians in case of its dissolution, as long as Lithuania, Latvia, Estonia and Finland were recognized as parts of the Soviet sphere of influence. Another clause of the treaty was that Bessarabia, then part of Romania, was to be joined to the Moldovan ASSR, and become the Moldovan SSR under control of Moscow. On September 1, 1939, the German invasion of Poland started World War II. Stalin decided to intervene, and on September 17 the Red Army entered eastern Poland and the Baltic states and annexed these territories. In November 1939, Stalin sent troops over the Finnish border provoking war. The Winter War between the Soviet Union and Finland proved to be more difficult than Stalin and the Red Army were prepared for, and the Soviets sustained high casualties. The Soviets prevailed in March, 1940, but the problems of the Soviet army had been revealed to the rest of the world, including Germany. On March 5, 1940, the Soviet leadership approved an order of execution for more than 25,700 Polish "nationalist, educators and counterrevolutionary" activists in the parts of the Ukraine and Belarus republics that had been annexed from Poland. This event has become known as the Katyn Massacre. In June 1941, Hitler broke the pact and invaded the Soviet Union in Operation Barbarossa. Although expecting war with Germany, Stalin may not have expected an invasion to come so soon — and the Soviet Union was relatively unprepared for this invasion. An alternative theory suggested by Viktor Suvorov claims that Stalin had made aggressive preparations from the late 1930s on and was about to invade Germany in summer 1941. Thus, he believes Hitler only managed to forestall Stalin and the German invasion was in essence a pre-emptive strike. This theory was supported by Igor Bunich, Mikhail Meltyukhov (see Stalin's Missed Chance) and Edvard Radzinsky (see Stalin: The First In-Depth Biography Based on Explosive New Documents from Russia's Secret Archives). Most Western historians reject this thesis, though. In the diary of General Fedor von Boch, it is also mentioned that the Abwehr fully expected a Soviet attack against German forces in Poland no later than 1942. Such speculations are difficult to substantiate, however, as information on the Soviet Army from 1939 to 1941 remains classified, but it is known that the Soviets had received some warnings of the German invasion through their foreign intelligence agents, such as Richard Sorge. Even though Stalin received intelligence warnings of a German attack , he sought to avoid any obvious defensive preparation which might further provoke the Germans, in the hope of buying time to modernize and strengthen his military forces. In the initial hours after the German attack commenced, Stalin hesitated, wanting to ensure that the German attack was sanctioned by Hitler, rather than the unauthorized action of a rogue general. The Germans initially made huge advances, capturing and killing millions of Soviet troops. The Soviet Red Army put up fierce resistance during the war's early stages, but they were plagued by an ineffective defense doctrine against the better-equipped, well-trained and experienced German forces. Stalin feared that Hitler would use disgruntled Soviet citizens to fight his regime, particularly people imprisoned in the Gulags. He thus ordered the NKVD to take care of the situation. They responded by executing hundreds of thousands (perhaps more) of prisoners throughout the Western parts of the Soviet Union. Many others were simply deported. Hitler's experts had expected eight weeks of war, and early indications appeared to support their predictions. However, the invading German forces were eventually driven back in December 1941 near Moscow. The Big Three: British Prime Minister Winston Churchill, U.S. President Franklin D. Roosevelt and Stalin at the Yalta Conference. 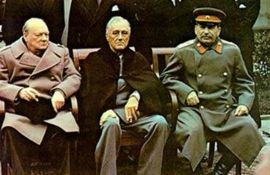 Stalin met in several conferences with Churchill and/or Roosevelt in Moscow, Tehran, Yalta, and Potsdam to plan military strategy (Truman taking the place of the deceased Roosevelt). "Marshal Stalin as a negotiator was the toughest proposition of all. Indeed, after something like thirty years' experience of international conferences of one kind and another, if I had to pick a team for going into a conference room, Stalin would be my first choice. Of course the man was ruthless and of course he knew his purpose. He never wasted a word. He never stormed, he was seldom even irritated." His shortcomings as strategist are frequently noted regarding massive Soviet loss of life and early Soviet defeats. An example of it is the summer offensive of 1942, which led to even more losses by the Red Army and recapture of initiative by the Germans. Stalin eventually recognized his lack of know-how and relied on his professional generals to conduct the war. Yet Stalin did rapidly move Soviet industrial production east of the Volga River, far from Luftwaffe-reach, to sustain the Red Army's war machine with astonishing success. Additionally, Stalin was well aware that other European armies had utterly disintegrated when faced with Nazi military efficacy and responded effectively by subjecting his army to galvanizing terror and unrevolutionary, nationalist appeals to patriotism. He even appealed to the Russian Orthodox church and images of national Russian heroes for that matter. On November 6, 1941, Stalin addressed the whole nation of the Soviet Union for the second time (the first time was earlier that year on July 2). According to Stalin's Order No. 227 of July 27, 1942, any commander or commissar of a regiment, battalion or army, who allowed retreat without permission from above was subject to military tribunal. The Soviet soldiers who surrendered were declared traitors; however most of those who survived the brutality of German captivity were mobilized again as they were freed. Between 5% and 10% of them were sent to gulags. The Soviet Union suffered the second highest number of civilian losses (20 million) yet the highest number of military losses (at least 8,668,400 Red Army personnel) in World War II. The Nazis considered Slavs to be "sub-human", and many people believe the Nazis killed Slavs as an ethnically targeted genocide. This concept of Slavic inferiority was also the reason why Hitler did not accept into his army many Soviet citizens who wanted to fight the regime until 1944, when the war was lost for Germany. In the Soviet Union, World War II left a huge deficit of men of the wartime fighting-age generation. To this day the war is remembered very vividly in Russia, Belarus, and other parts of the former Soviet Union as the Great Patriotic War, and May 9, "Victory Day", is one of Russia's biggest national holidays. 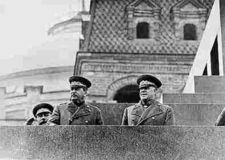 Stalin and Zhukov on the tribune of Lenin's Mausoleum. Domestically, Stalin was seen as a great wartime leader who had led the Soviets to victory against the Nazis. By the end of the 1940s, Russian patriotism increased. For instance, some inventions and scientific discoveries were reclaimed by Russian researchers. Examples include the boiler, reclaimed by father and son Cherepanovs; the electric bulb, by Yablochkov and Lodygin; the radio, by Popov; and the airplane, by Mozhaysky. Stalin's internal repressive policies continued (including in newly acquired territories), but never reached the extremes of the 1930s. Internationally, Stalin viewed Soviet consolidation of power as a necessary step to protect the USSR by surrounding it with countries with friendly governments like the variety seen in Finland, to act as a cordon sanitaire (buffer) against possible invaders (while the West sought a similar buffer against alleged "communist expansion"). He had hoped that American withdrawal and demobilization would lead to increased communist influence, especially in Europe. Each side might view the other's defensive actions as destabilizing provocations and these security dilemmas frayed relations between the Soviet Union and its former World War II western allies and led to a prolonged period of tension and distrust between East and West known as the Cold War (see also Iron curtain). In Asia, the Red Army had overrun Manchuria in the last month of the war and then also occupied Korea above the 38th parallel north. Mao Zedong's Communist Party of China, though receptive to minimal Soviet support, defeated the pro-Western and heavily American-assisted Chinese Nationalist Party in the Chinese Civil War. The Communists controlled mainland China while the Nationalists held a rump state on the island of Formosa (now Taiwan). The Soviet Union soon after recognized Mao's People's Republic of China, which it regarded as a new ally. Diplomatic relations reached a high point with the signing of the 1950 Sino-Soviet Treaty of Friendship and Alliance. Both countries provided military support to a new friendly state in North Korea. After various border conflicts, war broke out with U.S.-allied South Korea in 1950, starting the Korean War. A meeting between Stalin and Mao Zedong after the CPC's 1949 victory over the KMT in the Chinese Civil War. In Europe, there were Soviet occupation zones in Germany and Austria. Hungary and Poland were under practical military occupation. From 1946-1948 coalition governments comprising communists were elected in Poland, Czechoslovakia, Hungary, Romania and Bulgaria and homegrown communist movements rose to power in Yugoslavia and Albania. These nations became known as the "Communist Bloc." Britain and the United States supported the anti-communists in the Greek Civil War and suspected the Soviets of supporting the Greek communists although Stalin ended refrained from getting involved in Greece, dismissing the movement as premature. Albania remained an ally of the Soviet Union, but Yugoslavia broke with the USSR in 1948. Greece, Italy and France received enormous support from the population, which were at the very least friendly towards Moscow. Both Superpowers viewed Germany as key. In retaliation to the Western formation of Trizonia, Stalin determined to take action. Armed with intelligence from the British agent Donald Duart Maclean and other British and American espionage agents, Stalin was well aware that the United States possessed neither a sufficient atomic bomb arsenal nor the production capacity needed to produce atomic weapons to destroy Soviet or Communist land forces either in Europe or the Far East. He therefore ordered a blockade of West Berlin, which was under British, French, and U.S. occupation, to force these powers in retaliation for the planned militarisation of the western-occupied of Germany. Similar to what America did with South Korea, Stalin also extensively armed Kim Il Sung's North Korean army and air forces (with military equipment and advisors far in excess of that required for defensive purposes) in order to facilitate Kim's aim to unify the Korean peninsula. The Berlin Blockade failed due to the unexpected massive aerial resupply campaign carried out by the Western powers known as the Berlin Airlift. In 1949, Stalin conceded defeat and ended the blockade. After West Germany was formed by the union of the three Western occupation zones, the Soviets declared East Germany a separate country in 1949, ruled by the communists. Stalin originally supported the creation of Israel in 1948. The USSR was one of the first nations to recognize the new country. Golda Meir came to Moscow as the first Israeli Ambassador to the USSR that year. But he later changed his mind and came out against Israel. In Stalin's last year of life, one of his last major foreign policy initiatives was the 1952 Stalin Note for German reunification and Superpower disengagement from Central Europe, but Britain, France, and the United States viewed this with suspicion and rejected the offer. Stalin made few contributions to Communist (or, more specifically, Marxist-Leninist) theory, but the contributions he did make were accepted and upheld by all Soviet political scientists during his rule. Among Stalin's contributions were his "Marxism and the National Question", a work praised by Lenin; his "Trotskyism or Leninism", which was a factor in the "liquidation of Trotskyism as an ideological trend" within the CPSU(B). Stalin's Collected Works (in 13 volumes) was released in 1949. A subsequent 16 volume American Edition appeared, in which one volume consisted of the book "History of the CPSU(B) Short Course", although when released in 1938 this book was credited to a commission of the Central Committee. In 1936, Stalin announced that the society of the Soviet Union consisted of two non-antagonistic classes: workers and kolkhoz peasantry. These corresponded to the two different forms of property over the means of production that existed in the Soviet Union: state property (for the workers) and collective property (for the peasantry). In addition to these, Stalin distinguished the stratum of intelligentsia. The concept of "non-antagonistic classes" was entirely new to Leninist theory. Stalin and his supporters, in his own time and since, have highlighted the notion that socialism can be built and consolidated in just one country, even one as underdeveloped as Russia was during the 1920s, and indeed that this might be the only means in which it could be built in a hostile environment. Stalin's body in Lenin's Mausoleum. On March 1, 1953, after an all-night dinner with interior minister Lavrenty Beria and future premiers Georgi Malenkov, Nikolai Bulganin and Nikita Khrushchev, Stalin collapsed in his room, having probably suffered a stroke that paralyzed the right side of his body. Although his guards thought it odd that he did not rise at his usual time, the next day they were under orders not to disturb him and he was not discovered until that evening. He died four days later, on March 5, 1953, at the age of 74, and was buried on March 9. His daughter Svetlana recalls the scene as she stood by his death bed "He suddenly opened his eyes and cast a glance over everyone in the room. It was a terrible glance. Then something incomprehensible and awesome happened. He suddenly lifted his left hand as though he were pointing to something above and bringing down a curse upon all of us. The next moment after a final effort the spirit wrenched its self free of the flesh." Officially, the cause of death was listed as a cerebral hemorrhage. His body was preserved in Lenin's Mausoleum until October 31, 1961, when his body was removed from the Mausoleum and buried next to the Kremlin walls as part of the process of de-Stalinization. It has been suggested that Stalin was assassinated. The ex-Communist exile Avtorkhanov argued this point as early as 1975. The political memoirs of Vyacheslav Molotov, published in 1993, claimed that Beria had boasted to Molotov that he poisoned Stalin: "I took him out." Khrushchev wrote in his memoirs that Beria had, immediately after the stroke, gone about "spewing hatred against [Stalin] and mocking him", and then, when Stalin showed signs of consciousness, dropped to his knees and kissed his hand. When Stalin fell unconscious again, Beria immediately stood and spat. In 2003, a joint group of Russian and American historians announced their view that Stalin ingested warfarin, a powerful rat poison that inhibits coagulation of the blood and so predisposes the victim to hemorrhagic stroke (cerebral hemorrhage). Since it is flavorless, warfarin is a plausible weapon of murder. The facts surrounding Stalin's death will probably never be known with certainty. His demise arrived at a convenient time for Beria and others, who feared being swept away in yet another purge. It is believed that Stalin felt Beria's power was too great and threatened his own. Whether or not Beria or another usurper was directly responsible for his death, it is true that the politburo did not summon medical attention for Stalin for more than a day after he was found. Roses for Stalin (1949), painting by Boris Vladimirski. 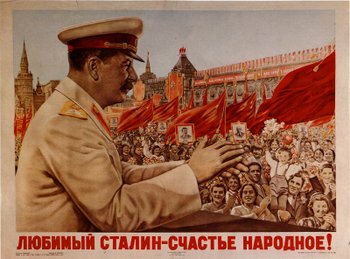 Stalin created a cult of personality in the Soviet Union around both himself and Lenin. The embalming of the Soviet founder in Lenin's Mausoleum was performed over the objection of Lenin's widow, Nadezhda Krupskaya. Stalin became the focus of massive adoration and even worship. Numerous towns, villages and cities were renamed after the Soviet leader (see List of places named after Stalin) and the Stalin Prize and Stalin Peace Prize were named in his honour. He accepted grandiloquent titles (e.g. "Coryphaeus of Science," "Father of Nations," "Brilliant Genius of Humanity," "Great Architect of Communism," "Gardener of Human Happiness," and others), and helped rewrite Soviet history to provide himself a more significant role in the revolution. At the same time, according to Khrushchev, he insisted that he be remembered for "the extraordinary modesty characteristic of truly great people." Many statues and monuments were erected to glorify Stalin but all of them distorted Stalin's true build. Going by these monuments and statues it would be easy to assume that Stalin was a tall and well built man not unlike Tsar Alexander III. This was not the case however; photographic evidence suggests he was between 5'5" and 5'6" , hardly tall or imposing. His physical stature was exaggerated in all portraits and statues to avoid any image of weakness that could harm his cult of personality. Trotsky criticized the cult of personality built around Stalin as being against the values of socialism and Bolshevism, in that it exalted the individual above the party and class and it disallowed criticism of Stalin. The personality cult reached new levels during the Great Patriotic War, with Stalin's name even being included in the new Soviet national anthem. Stalin became the focus of a body of literature encompassing poetry as well as music, paintings and film. Artists and writers vied with each other in fawning devotion, crediting Stalin with almost god-like qualities, and suggesting he single-handedly won the Second World War. Comrades! I want to propose a toast to our patriarch, life and sun, liberator of nations, architect of socialism [he rattled off all the appellations applied to him in those days] – Joseph Vissarionovich Stalin, and I hope this is the first and last speech made to that genius this evening. In recent years, support of Stalin has resurged. Millions of Russians, exasperated with the downfall of the economy and political instability after the breakup of the Soviet Union, want Stalin back. 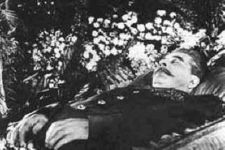 A recent controversial poll revealed that over thirty-five percent of Russians would vote for Stalin if he were still alive. This is seen by some as a return of Stalin's cult. 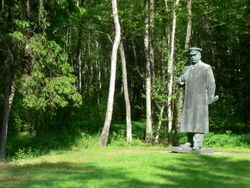 Grutas Park is home to only one monument of Stalin, originally set up in Vilnius. Under Stalin's rule the Soviet Union was transformed from an agricultural nation into a global superpower at the cost of millions of lives. The USSR's industrialization was successful in that the country was able to defend against and eventually defeat the Axis invasion in World War II, though at an enormous cost in human life. However, historian Robert Conquest and other Westerners claim that the USSR was bound for industrialization, and that its speed along this course was not necessarily improved by Bolshevik influence. It has also been argued that Stalin was partially responsible for the initial military disasters and enormous human causalities during WWII, because Stalin eliminated many military officers during the purges, and especially the most senior ones, and rejected the massive amounts of intelligence warning of the German attack. While Stalin's social and economic policies laid the foundations for the USSR's emergence as a superpower, the harshness with which he conducted Soviet affairs was subsequently repudiated by his successors in the Communist Party leadership, notably in the denunciation of Stalinism by Nikita Khrushchev in February 1956. In his "Secret Speech", On the Personality Cult and its Consequences, delivered to a closed session of the 20th Party Congress of the Communist Party of the Soviet Union, Khrushchev denounced Stalin for his cult of personality, and his regime for "violation of Leninist norms of legality". However, his immediate successors continued to follow the basic principles of Stalin's rule -- the political monopoly of the Communist Party presiding over a command economy and a security service able to suppress dissent. The large-scale purges of Stalin's era were never repeated, but the political repression continued. His first name is also transliterated as Iosif. His original surname, ჯუღაშვილი, is also transliterated as Jugashvili. The Russian transliteration is Джугашвили, which is in turn transliterated into English as Dzhugashvili and Djugashvili; – შვილი – shvili is a Georgian suffix meaning "child" or "son". There are several etymologies of the ჯუღა (jugha) root. In one version, it is the Ossetian for "rubbish"; the surname Jugayev is common among Ossetians, and before the revolution the names in South Ossetia were traditionally written with the Georgian suffix, especially among Christianized Ossetians. In a second version, the name derives from the village of Jugaani in Kakhetia, eastern Georgia. An article in the newspaper Pravda in 1988 claimed that the word derives from the Old Georgian for "steel" which might be the reason for his adoption of the name Stalin. Сталин (Stalin) is derived from combining the Russian сталь (stal), "steel", with the possessive suffix –ин (–in), a formula used by many other Bolsheviks, including Lenin. It has also been said that, originally, "Stalin" was a conspiratorial nickname which stuck with him. Like other Bolsheviks, he became commonly known by one of his revolutionary noms de guerre, of which Stalin was only the most prominent. He was also known as Koba (after a Georgian folk hero, a Robin Hood-like brigand); and he is reported to have used at least a dozen other names for the purpose of secret communications. Most of them remain unknown. 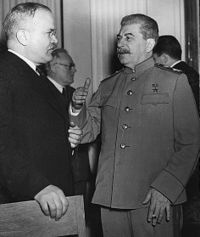 Directly following World War II, as the Soviets were negotiating with the Allies, Stalin often sent directions to Molotov as Druzhkov. Among his other nicknames and aliases were Ivanovich, Soso or Sosso (mainly his boyhood name), David, Nizharadze or Nijeradze, and Chizhikov. 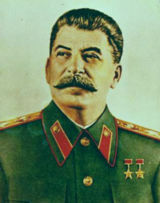 Stalin was nicknamed "Uncle Joe" by the Western media. When told of this nickname by Franklin D. Roosevelt, he almost walked out of the Yalta Conference . Robert Steadman — Symphony No. 2: The Death of Stalin tells of the astonishing events surrounding the death and funeral of Joseph Stalin. The piece was commissioned by Nottingham Youth Orchestra and was premiered by them, conducted by Derek Williams, at the Royal Concert Hall, Nottingham, in March 2003 — the 50th anniversary of his death. Stalin — A 1992 Hollywood TV movie. The Inner Circle — A 1991 Hollywood movie. We Didn't Start the Fire - Billy Joel's history themed song; Stalin's mentioned as the first figure of the 5th stanza (after the first chorus). Animal Farm — George Orwell's novel, a history of the Soviet Union from the revolution to the Tehran Conference told through allegory; Stalin served as the direct basis for the character Napoleon. The First Circle - Alexander Solzhenitsyn's novel where Stalin is depicted as vain and vengeful, remembering with pleasure the torture of a rival, and dreaming of one day becoming emperor of the world. Histeria! episode "The Russian Revolution" - Stalin is featured in a sitcom parody sketch where he sends the KGB to arrest anyone who upsets "his little buddy", Froggo.